Sometimes we need help but we're not able to ask for it. 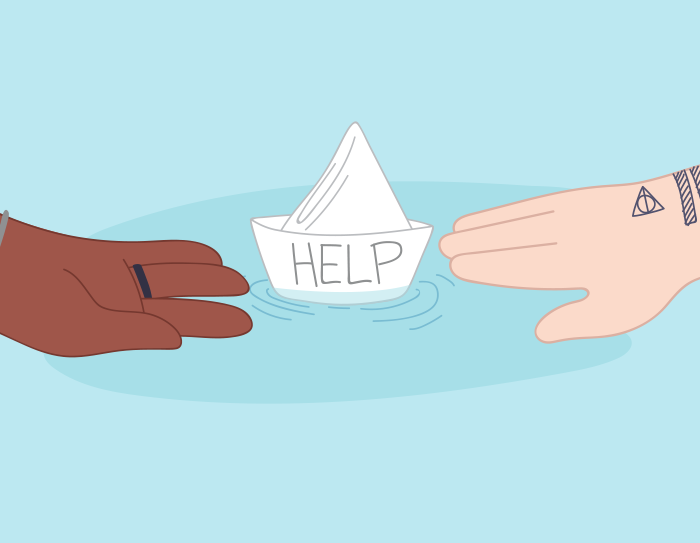 We've got tips on how to ask for help when things get tough. Managing everything on your own is fine - until it's not! Asking for help, no matter how big or small the issue might be, is often hard to do. Some people see it as a negative thing but we’re here to show you that’s simply not the case! Knowing that you’re in need of help can be hard to admit because we’re often taught to be self-reliant and independent. Asking for help can feel very uncomfortable and some people describe having to ‘swallow their pride’ in order to reach out for support. It takes courage to reach out and say that you’re not managing, you’re unsure about something, or you just need a shoulder to cry on. I want help but I can't ask! So what exactly gets in the way of asking for help? Sometimes we just need help and there's no shame in that. Everybody needs help at times including your parents, siblings, friends, co-workers, and supervisors! Helping someone is a win-win - it not only feels good for the person who is helping you but it's going to make your life a lot easier too! So how do you know when to get help? When you’re at university, Tafe or work and you really don’t know what you’re supposed to be doing - don’t torture yourself by trying to figure it out on your own, instead ask someone to give you a hand. When you’re overloaded with responsibilities like work, study, being in a relationship, family events, and spending time with friends – get help to rearrange some things or get support from a friend. When you’re feeling unable to cope, are under a lot of stress, feel scared or confused, or you feel like hurting yourself – get help from a professional like a doctor, counsellor, or psychologist. You’re struggling with a crisis or something’s happened in your life that’s upsetting, scary, or you’re unsure what to do. Talk to somebody you can trust like a friend, family member, or a counsellor. When you make a mistake have the courage to admit it and then ask for help. It’s ok to make mistakes – after all that’s how we learn! Get help from somebody so you can get better at it. It's time to change the way you think about asking for help! Don’t fall into the trap of thinking you have to do everything yourself. Accept that you’re only human – you’re not supposed to be doing everything perfectly all the time. Helping another person actually makes us feel good – give your friends and family the chance to help you. Sharing your struggles with people you trust and asking for support strengthens your relationships. We might convince ourselves there’s never a good time to ask for help – don’t worry too much about that. What’s important is that you say something to somebody you trust. It takes courage to put yourself out there and ask for help – so be brave and give it a go. Ask for help today - you can do it! Practice asking for help with the little things, so when the big stuff happens you know what to do. Remember, not matter how big or small the issue might be, asking for help is a good skill to have! Everybody could use a little help. Kids Helpline is here for you 24/7 and we can help you with any issue, anytime. Give us a call, start a WebChat or email us today.